Home/News/The Story of Louie Cacchioli. I met a guy last week. An inspiring young man. A motivated and responsive employee. His name was Louie Cacchioli. Louie is pictured above in his New York City fireman’s gear. He was a NYC fireman at 9/11 and yes, he was in the tower and saved people’s lives. And he almost died doing it. But I did not know that when I first met him. And he did not know me. Here is the story. Our company recently exhibited at the WOCN medical conference in Philadelphia. It is an event attended by thousands of nurses each year – as they go to workshops and learn about the latest trends, tools and opportunities to improve their operation. Our new product, WoundWiseIQ, is an imaging analytics tool that helps more quickly and effective analyze the healing progress of a chronic wound. So, we were excited! There was an opportunity to meet many new potential customers and show them what we can do to help improve their wound healing results. We prepared prior to the event to improve our product and our demo (and my demo ability!) so we could handle the flow and the questions and activity. I said, ‘Yeah sure that would be great, what do you think we can do?’ He said ‘My name is Louie. If you trust me, I will take the panel in the back with the guys and we will try to flatten it out.’ He had a lot of co-worker fellows who were installing carpet, electrical, and other items to help get the exhibit hall ready to go. So I gave him the mangled panel and thanked him so much for simply stopping by to help, and to do what he can! So off he went. About 20 minutes later, Louie comes back with one of his colleagues. The panel looked much better, but I still was thinking in my mind whether I could even get it to stay up on the backdrop. Louie did not just let it stop there. He said, ‘Can we help you put that panel up?’ Is that a great, customer-driven employee?! He read his customer’s mind and understood his customer’s concerns before the customer even expressed it. Louie and his colleague proceeded to help me put my booth together for the next 30 minutes. Now there were probably one hundred exhibitors. But they stayed with me, like we all would want our customer service employees to stay with our customers when they need us. And in the end – the booth looked sharp. Real sharp. I was at my booth an hour later putting the final touches together on our technology, and was getting ready to go over to the hotel to check in. So I look up and there he was again. Louie, in his golf cart smiling. I walked over. He said, ‘You didn’t have to do that. But I wanted you to know that I appreciate it very much. And I want to do a favor for you Gary. I am going to make your day.’ He pulls the picture at the top of this article out of his backpack, and signs it. ‘Dear Gary, God Bless. 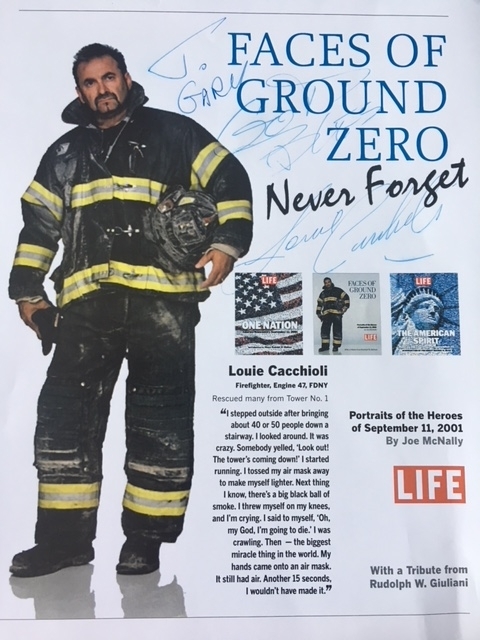 Louie Cacchioli.’ He tells me his story of 9/11 – how after saving a group of people, he was eventually buried in the rubble of the 2nd tower falling. His friends dug him out and saved him. It changed his life. I told him my story of 9/11, and how I came in and was on the ground days after it happened, to help my CIO customers get their data center power going again – major corporations (NYSE and others) on Manhattan. I was president of a 600-person technology services company, but that changed to 599 when we tragically lost one of our employees in the tower. As a tribute to him, we erected a monument and flag at our headquarters in Columbus Ohio and invited his family out – it still stands there today. Louie and I could have talked for a long time – we shook hands and expressed hope that we would meet again. So this blog is a dedication to my new friend Louie Cacchioli. A great young man. A dedicated customer-driven employee for his company. A hero who clearly dedicates his life to helping and inspiring other people. WE ARE RESPONSIVE. We listen and learn. We have a sense of urgency. We are hands-on. We do this because of our deep desire to make our customers raving fans. WE BUILD INNOVATIVE PRODUCTS. We create technology that improves operations and provides valuable information and hope – to patients and those who care for them. WE BUILD RELATIONSHIPS. We want to win and push hard, but we are also humble. It takes a team, including our customers and partners, to achieve true success. The bottom line is this: If you as a leader can inspire your team to bring out their personal passion and desire – people will notice, and that can help take your organization all the way to the top! WoundWiseIQ might be able to help you get to the top as well! To learn more about the latest developments in wound imaging and view a demonstration of this powerful tool to improve patient care, e-mail us: support@medcomplianceIQ.com.